This year's new Star Wars movie is unlike any Star Wars movie we've seen before. To some, this seems to be frustrating and upsetting - it's not what they wanted to see, or were expecting, and it doesn't deliver in some ways. For me, however, it's a refreshing and exciting movie that gives us something different and still packs a punch. To jump right into this I will say up front, even after 3 viewings, I still don't quite "love" The Last Jedi (some of the humor still makes me cringe). I very much like it, and I enjoy it, and there are some moments and some parts I love. But overall, the movie isn't one of my favorites this year (it won't be on my Top 10). That said, there's still so much to it (not only to discuss) but to admire and appreciate and learn from. Note: this review contains spoilers to discuss everything that happens, so only read if you're ready. After 3 complete viewings, I feel I've been able to identify the key themes of Rian Johnson's The Last Jedi that are very strong and vital when examining the whole movie and its influence. One of the big ones comes straight from Yoda, who tells Luke: "failure - the most important lesson of them all." Luke has had to learn this lesson many times in his life (just go watch Empire Strikes Back, you'll understand) and now it's more important than ever. His last great failure (letting Ben Solo become Kylo Ren) was so disastrous and awful, that he completely turned himself off from the Force. Disconnecting from it all and hiding away. But his eventual return, which is definitely earned by the end of the movie, comes from a place of (as Leia states) peace and purpose, not necessarily vindication or revenge or anything of that sort. Which is what leads right into the next theme that left a strong impression upon me - hate shouldn't be a driving force of our actions. The most fulfilling character arc in The Last Jedi is that of Rose Tico (played by Kelly Marie Tran), who goes from being a lowly mechanic ("I work behind pipes all day") to a full-on hero. After the climatic scene on Crait where she nearly sacrifices herself to save Finn from sacrificing himself, she utters: "We need to fight to save what we love, not destroy what we hate." It's so true. And throughout most of the movie, many of the characters have to learn this lesson the hard way. Kylo Ren (played by the very talented Adam Driver), most often, almost always lets his rage and hate take over, and yet he achieves nothing when this happens. It's his weakness. The best example is when Luke shows up at the end and he fires all the weapons at him. By doing so, he wastes valuable time which allows the remaining group of Rebels to escape. His loss. What I really love about The Last Jedi, despite having problems with some of its aspects, is that it is more of a movie about these themes and these lessons than anything else. It is not a movie about big fights and fan service, it is about the characters: their struggles, their hopes, their fears, their weaknesses, their strengths, their growth and lessons learned. It's a complex film because of what they all go through. And it's a different film, because it's not trying to satisfy the desires of rabid fans, but rather gives us something new and forces us to challenge our own ideas of heroes/villains. 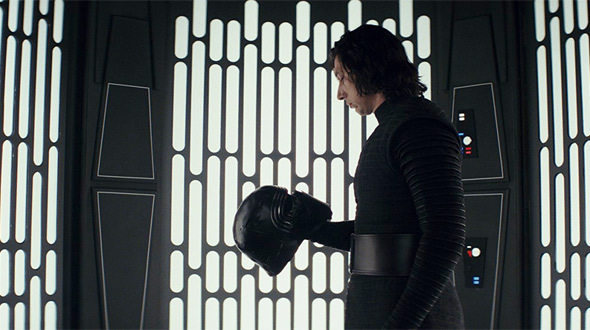 Kylo struggles with his own past, and the moments where he briefly slips up (not firing upon Leia's ship, and killing Snoke himself) are such nuanced cracks in his personality that they speak volumes about how we all have complex internal struggles. It's refreshing to see a film work in this kind of intimate complexity instead of just giving us mostly black and white characters. 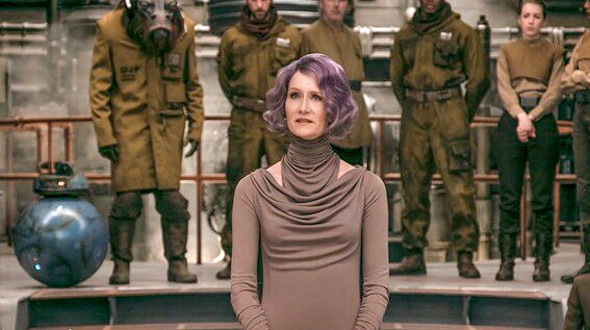 Another example of this kind of complex character dynamic involves the purple-haired Rebel leader Vice Admiral Holdo, played by Laura Dern. Oh man, did I hate her - at first. She has such a snarky, annoying "I am the leader and I know better than you" attitude that I couldn't stand. And it's fascinating because she goes from this cocky attitude, to becoming a little soft and friendly, to getting stern again because she wants to save the Rebels her way, to realizing there is no hope left, to sacrificing herself to save everyone. It's a wonderful progression. And she also tries to help Poe learn a lesson about being a leader, which came off a bit too heavy-handed to me. But despite all of this, she finishes with the most badass take-that move in the entire movie - sending the frigate into lightspeed pointed directly at Snoke's ship, splitting it in half in the most eye-opening, glorious shot of the entire movie. One of my favorite scenes that always makes me smile. The other key theme in The Last Jedi is stated outright by Kylo Ren: "Let the past die. Kill it if you have to." Of course, in the context of the story he's talking to Rey (played perfectly by Daisy Ridley) about how she needs to let go of her past, her parents, like he has in order to become the person he/she is meant to be. But this line is also directly related to the idea that The Last Jedi is trying to distance itself from the past, from the original trilogy and prequels, and become something new. Perhaps it went too far, too fast, and some fans weren't ready for that. But it's something very big they're achieving with this movie. It's a major step forward in saying that it's time to allow the Star Wars movies to move beyond Luke Skywalker and Han Solo and take us on new journeys, with new characters, new revelations. Of course, we have new characters, but it's still tied to the Skywalker saga (Luke, Han, Vader, Leia). Jacob Hall also wrote about this in his editorial. One of the major reveals in the movie is with Rey admitting that her parents were nobodies, random junk traders who sold her off. It's a big twist, a surprise pretty much no one was expecting, but it hit me hard and still impresses me. First off, to buck the trend (of what was expected - she came from some special Jedi or someone important) and give us this answer is a bold move. More importantly, it very overtly introduces a new concept - you can be a "nobody", from "nobody" parents/family, and still become a "somebody", a hero (in this case a Jedi), who can change the world galaxy. This is one of the most inspiring ideas in the movie, that you don't need to be anyone special, in order to grow to become someone with the ability to change the world (for better or worse). It's a very powerful idea, and I hope this actually connects with many viewers. Understanding these themes, interpreting them and analyzing them beyond the surface, and then looking at the movie that Rian Johnson gave us, has helped me to appreciate it more and more. It's a very dense movie with pretty much every last thing thrown in - lots of humor, lots of spectacle, drama, comedy, thrills, sad moments, happy moments, big fights, small fights, lightsaber battles, good droids, bad droids, spaceships galore, aliens galore. But when you really get down to what it's about and what it's trying to achieve (among other things: moving on from the past and then inspiring us to fight to save the good rather than destroy what we hate) it's possible to actually enjoy it even more. Yes, some of the jokes still bother me, but I still love these more grand moments that will resonate with new generations, younger viewers, and open minds. One of my biggest complaints about The Last Jedi is that Rey is underused, and doesn't do much in it. But I think this is actually her big lesson to learn. She wants to jump in and fight and save everyone and fix everything right now. But she has to take extra time to learn, she needs to master the Force first. 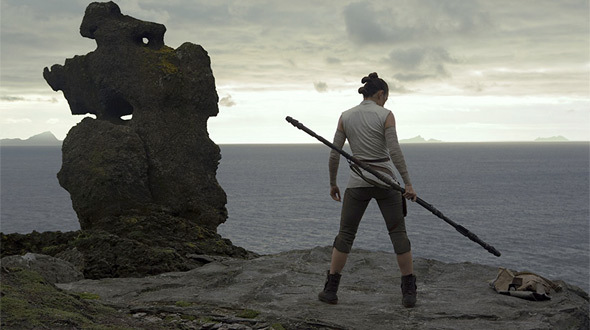 Her patient learning comes full circle by the end, in an amusing way, when she literally has to move rocks to save everyone despite Luke telling her back on the island that the Force is not about moving rocks. (I do like this progression with her, because it's about her learning in the most mundane way.) My other complaints are that I feel like some of the humor doesn't work. And the pacing in the middle of the movie is off, slowing it down even though there are exciting moments. Finally, I thought Benicio Del Toro was miscast and his character is a completely boring waste. His stutter is annoying, no matter how many times I see the movie. Rian Johnson's Star Wars: The Last Jedi takes some very bold steps in a new direction. It's a surprising, exciting, thrilling, fascinating, emotional space opera with a bit too much childish humor, but is still full of heart. No matter what you may think about it, there's so much to admire and consider and learn from the characters, and their decisions, and the stakes. I like movies that can incite discussions and arguments, that means there is something about them, and this is one that will be discussed endlessly. So, let's keep talking.